Here come the many posts of friends gathered around a homemade tree singing their favorite carols heralding the coming of Christmas. Don’t know about you, but I would rather be around a blazing hot fire, burning large chunks of meat, hot cider in one hand, and my beautiful wife in the other. This is the Christmas Grilling Series where anytime, especially holidays in the middle of winter, is the right time to grill. This year we bring you Bourbon Rotisserie Pork Roast, featuring a spiced-sugar rub, sweet bourbon mop sauce, and perfect roasting on the rotisserie. The secret to this dish is allowing the rub to thoroughly season the pork shoulder for several hours or even overnight. The rub is a combination of brown sugar, peppercorns, mustard seed, paprika, garlic powder, and onion powder heavily applied to the entirety of the pork. The mop is a thin sauce applied repeatedly while roasting for thorough caramelization and is a mixture of bourbon, brown sugar, onion, ketchup, corn syrup, and brown mustard. 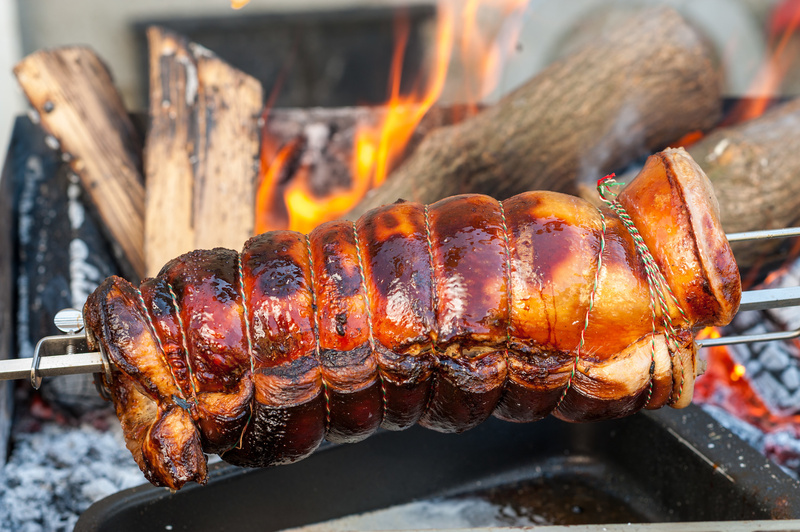 Properly secure the seasoned pork shoulder to the rotisserie and grill over low direct heat for 3½ to 4 hours until golden brown, crusted, and done. Slice and serve, and after one taste, carols and shouts of Hallelujah will abound. So fire up the grill, grab that hot apple cider, and make ready for that jolly time with the Christmas Grilling Series. To make rub, place peppercorns and mustard seed in a coffee grinder. Pulverize into a medium grind and place in small bowl. Add remaining rub ingredients. Season pork shoulder all over with rub, wrap in plastic and place in refrigerate for 12 to 15 hours. Remove roast from the fridge and let meat stand at room temperature 30-45 minutes before grilling. Season with kosher salt right before going onto the grill. While roast is resting, whisk ingredients for mop in a medium bowl. Set aside until ready to use. Preheat grill. Secure roast on rotisserie rod and cook over direct low heat for 3 1/2 to 4 hours. The internal temperature should be at least 145°F (63°C) when done. After the first hour of cooking, apply mop every 20 minutes for the remainder of cook time. Remove roast from the rotisserie, cover with foil, and let stand 10 minutes before slicing.